Vehicle engine-idling systems are beginning to appear in the auto industry aftermarket equipment sector in Japan as environmental issues move to center-stage. We found two Japanese companies offering devices that cut engine-idling automatically. 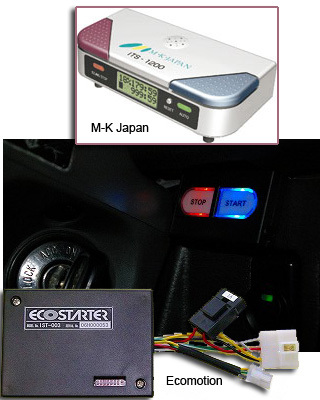 The aftermarket ITS-1200/2400 idle stopping system control box from M-K Japan, which can be mounted on the steering column, retails for about ¥57,000 ($645). The EcoStarter idle-stopping black box offered by Ecomotion is wired to on-off buttons that can be attached to the dashboard. The unit retails for about ¥40,000 ($452). Read more about idle-stop devices and Japan’s 10-year effort to stop idling at Lets Japan.